Every day, a new couple starts out on their journey as husband and wife. Many are better prepared than others when it comes to their finances. Despite the amazing soul he possesses and the attentive nature he brings to the table, there’s another factor that might not change your love for him, but it could change your view on how your finances are handled. So now what? His credit’s shot, yours is nearly flawless: is there a financial marriage made in heaven to be had? Here are a few of our tips; some from traditional sources like financial counselors and other tips straight from our readers’ own experiences. If you haven’t strolled down that magical aisle already, now’s the time to compare your financial education. Of course, we don’t recommend anyone’s credit score be a deal breaker; after all, you’re in love with his soul, not those three magical numbers. Still, you have to come to a mutual agreement on a number of things, including who ensures the monthly bills are paid. So first things first. Now’s the time to request copies of your credit scores. Make your comparisons, determine who has what weaknesses and strengths and go from there. Are there errors? Don’t underestimate the power of a divorce on a credit score, either. Today, more couples are entering second and even third marriages. Make sure those past mistakes aren’t going to complicate your efforts in a new marriage. If it’s a debt that a former spouse was ordered to pay, you may still be held accountable – but you should at least find out for sure. Remember, if you go into your marriage with $3,300 in credit card debt and your new spouse brings his own credit card balance of, say, $5,000, you’re now paying interest on $8,300 in credit card debt. It should be a top priority to pay down as much as you can as fast as you can. That said, it’s not recommended you open a joint credit card account with the goal of transferring those balances into one single account. While that’s rarely a bad idea, in a new marriage, it’s just wise economics to hold off for at least the first year. You might be Mrs. New Name, but you should keep your own credit. This is important for a few reasons. One, you worked hard for that great credit history. But, and as unromantic as this sounds, you just don’t know if you’ll grow old and wrinkled with your new husband or wife. Assume nothing. That’s not to say you can’t open co-accounts, but as long as a few of your more established accounts stay current with no additional users added in the meantime, the better your odds of being able to maintain that financial independence. If you or your spouse have a troubled credit history, be especially careful about adding him or her to your own already established accounts. Open discussion is absolutely crucial. You should have this conversation before the vow exchanges. You could have been raised in completely different homes that view money, wealth and debt in completely different ways. That’s not to say that if you were, it’s going to cause problems in your marriage, but you have to find a way to meet in the middle so that you’re building a strong financial foundation. said newlywed Stanc. Her idea is to take over the finances, but he was raised in a very traditional home where the man took care of finances. If you don’t know before you get married, you might find yourself stressing over your spouse’s money management views. So what happens if your credit scores vary greatly? Naturally, a strong credit score can be influenced by a lack of proper money management skills. Still, if you’re planning on buying a home or having any kind of joint account, there’s a lot at stake. Many counselors will suggest opening a credit card account together. Negotiate how that works beforehand, though. And don’t do it right away. When your spouse’s – or your – credit improves with steady debt reduction and on-time payments, only then should the idea of a joint account be discussed. Keep all credit card balances below 30 percent of their limits to maintain good credit scores. If your new husband is so disciplined that it would make Donald Trump envious, and your views amount to “Finance charges? What are those?”, then odds are, he’s going to want to control those purse strings, especially when it comes to accounts that have his name on them. That’s reasonable. The point is you have to make compromises, but it’s not a fair to expect the spouse or fiance to compromise those strong money habits. Finally, if either of you have no idea how to balance a checkbook, ask for help. And ask sooner rather than later. There are many places to turn. Speak with your pastor or priest. Your church could have resources available for newlyweds. 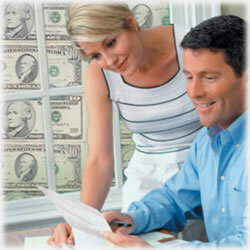 Meet with a financial counselor or debt expert. Take an online course. Whatever it is you do, remember this is going to pave the way for a stronger marriage in the long run. With many couples citing financial differences and difficulties as a cause for divorce, there’s no denying the influence our finances have on our marriages and other relationships. Don’t underestimate how powerful that aspect of your marriage will be.